“Makes a living by travelling, talking a lot and sometimes writing stuff down. Galericulate author, polymath and occasional smarty-pants.” John Dolan hails from a small town in the North-East of England. Before turning to writing, his career encompassed law and finance. He has run businesses in Europe, South and Central America, Africa and Asia. He and his wife Fiona currently divide their time between Thailand and the UK. Time to chat with John! My latest novel, Restless Earth (which was published last week), is the first in a trilogy of books entitled Karma’s Children, and it features my anti-hero private detective David Braddock. Braddock is the lead protagonist in a series of four mystery books published between 2012 and 2016, collectively called Time, Blood and Karma. My original intention back in 2011 (when all this authoring madness came upon me) was to write a series of seven books; but I decided for various reasons to split these into two series. Restless Earth has been constructed in such a way that readers who have not previously read any of my books can jump straight in without getting lost. 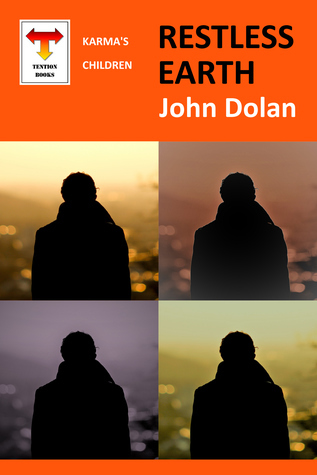 For those resilient bookworms who have somehow had the stamina to burrow their way through the previous four novels, Restless Earth picks up where the last series left off. What are the special challenges in writing a series? My Karma mystery books were all conceived at the same time: there was always going to be seven of them. One might say there is one long narrative arc spanning all seven books, with each individual book also containing a self-contained story. For me, there were (and still are) three specific challenges. First, I want the concept of karma and some underlying aspects of Eastern philosophy to permeate the writing and plots, and to provide a unifying theme. Second, the reader must be aware of a broader story trajectory while finding enjoyment in the particular plot of any specific book. While there will be loose ends at the end of each individual novel, I did not want to create a cliff-hanger scenario: I personally find this annoying when I encounter it – and it makes me feel cheated. Third, character development must be paced: a collection of seven books is, after all, more of a marathon than a sprint. How did you choose the genre you write in? Or did it choose you? I describe my Karma books as mystery novels. They do, after all, feature a private detective and multiple crimes to be solved. However, in my view, they hover around a number of genres – sometimes literary fiction, sometimes thriller, and with some philosophy thrown in for good measure. And, without (hopefully) getting too pretentious about it, over the course of the seven books, they are more like a family saga incorporating the story of one man’s life journey. Wait, that is horribly pretentious. Oh, OK, too late now. The funny thing is, when I started writing Everyone Burns – my first book – I didn’t even consider genre, and I certainly wasn’t writing to any kind of formula. Plus, I very rarely read crime or mystery stories, as I tend to prefer non-fiction. So, where all this stuff came from is the real mystery. I am currently editing a collection of my poetry, and trying to decide whether I have the courage to put it out into the public domain. Three years ago, I collaborated with another writer, Fiona Quinn, in co-authoring a completely off-the-wall black comedy/romance/thriller novel titled Chaos is Come Again. The most fascinating aspect of that project – which was fun, by the way, as Fiona is a great sport – was that Fiona and I have never actually met in person. We did the whole thing over the Internet, using Skype when we needed to chew things through. The time difference was a problem, as Fiona is on the US East Coast, and at the time, I was living in Thailand. But we found ways around the difficulties. Someday, we should probably write a book about the experience! Are you easily distracted while writing? If so, what to you do to help yourself focus? Did you see that butterfly? I’m sorry, what did you say? I can be easily distracted. It depends whether I am ‘in the Zone’ or not. I am not one of these people who can sit down at their laptop and write for hours. My creativity soon dries up, and my monkey mind starts jumping off in different directions. Recognising this, I do my writing in bursts of about two hours, usually sitting at a corner table in a coffee shop. If I try to write at home, I find there are too many other things to think about. So, if you enjoy my books, you can thank Starbucks. If you don’t like my books, blame Starbucks (I know I will). The choosing of character names is very important for me for two reasons. One, many of my characters are Thai – and Thai names are notoriously long and complicated; yet I have to find ones that are accessible to a Western readership. Two, I have LOTS of characters in my books, so I’ve learned to make sure their names are sufficiently different (and memorable where necessary) so as not to confuse my audience. In Everyone Burns there were two Thai characters whose family names began with the same first three letters (‘Cha-‘), and in retrospect, I consider that a mistake. As to the second part of the question, no, I’ve never changed a character’s name later. I have it in mind one day to write a philosophy book. My working title is Bloody Humans. As you might surmise, it’s not going to be a laugh a minute. Not recommended for anyone on suicide watch. Or indeed anyone, probably. Here’s one from my currently-unpublished poetry collection, so your readers are the first to see it. (I’m not sure whether that’s a reward or a punishment, but hey ho!) It’s an author’s plea, with due apologies to Philip Larkin. They keep you always on the edge. You feel like jumping off the ledge. Therefore, be gracious, let them live. It’s better if we just forgive. For a limited time, I have some free/discounted book offers – but you’ll have to act fast for some of them! On 27 and 28 November, my novel A Poison Tree is FREE on Amazon Kindle, and Everyone Burns is discounted to 99 cents. The short story Jim Fosse’s Expense Claim is permanently FREE (if you’d like to dip your toe into my writing). Also, until 31 December, you can enter a FREE giveaway for three paperback copies of my latest novel Restless Earth on Goodreads. Click on my Amazon Author Page link below and go from there for the Kindle offers. For the Goodreads giveaway, you will find a button below. For another few weeks, I live in Dubai, where I’ve been based for the last two and a half years. Our next ‘home base’ will be on the Thai island of Samui, where my wife and I built a house a few years back, and where many of my stories are located. For the next year or two, we will be splitting our time between South East Asia and the UK, and doing some travelling to exotic and/or weird parts of the world. After that, who knows? Since we started off on our expatriate odyssey in South Africa in 2004, we’ve become rather nomadic. I don’t think that’s going to change any time soon. I really, really wish I could be modest, but frankly, I’m so talented this is impossible. But seriously, there is no skill I hanker after. The secret to a happy life is being content with what you already have. Don’t you agree? Do you have any guilty pleasures? Yes, but obviously I can’t talk about them. If they were the sorts of things I could mention in public, then I don’t suppose they’d be guilty pleasures. I suppose I can just about mention chocolate, buying too many books, and talking way too much. If about five billion of us humans all stopped breathing today that would give the planet’s other species a well-earned respite. That aside, I would advocate (1) being more compassionate toward each other; (2) watching fewer advertisements so we want less useless stuff; and (3) eating less meat. I’m working on all three of these – but so far with mixed success. Giveaway ends December 31, 2017. See the giveaway details at Goodreads.